I am sure I have mentioned it here before that Chhori is not a great sleeper. She has very short naps 30-45 minutes at a time and even at nights she wakes up multiple times. So I always wish that she would sleep a bit longer so I can do something but there are times I don’t want her to sleep long. Today, for the second time this week, she was fast asleep while I left for work. I really wanted to wake her up but didn’t do it. She looked so peaceful sleeping that I wished I had longer time at home to see her wake up and smile at me. If I leave home late, I get stuck in traffic which will increase my travel time so I try to leave home early so I can come home to Chhori early . But the days when she is still asleep, I don’t get to interact with her at all in the morning and that makes it really hard to leave home. Normally I don’t say good bye to her when I leave in the morning anyway even though she is awake. AS takes her to a room before I go out of the home so she doesn’t see me leave and start crying but I still get to spend 20-30 minutes with her while I get ready for work. But the days she that doesn’t wake up, I get no time with her in the morning and it breaks my heart. All I can do is look at my sleeping baby. Being a working mum is a really hard thing to do. I know I have so many reasons to work and I am lucky to have a job to come back to but at the same time I feel so sad that I have to spend so many hours away from my baby. Thank God my parents are looking after her so I don’t have to drop off a screaming toddler at a day care but not being able to hold her in the morning makes me sad the whole day. I don’t know how to make this work. Any suggestion from all the wonderful mums out there is welcome. How do you all do it? I think I am still getting used to coming back to work after a year. I am so glad it is Friday today so I get to spend two full days with her. So looking forward to the weekends. I am sure weekends going to be even more precious from now on. 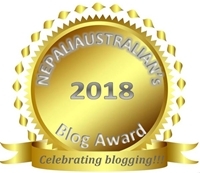 This entry was posted in Being Mum and tagged australian, australian nepali, baby, chhori, M from nepaliaustralian, Nepali, new mum, work, work home balance, working mum. Bookmark the permalink. Thank you, I am getting there slowly. I don’t think there is any magic way to overcome that feeling, except compassion, to replace sadness with sending abundant feelings of love towards your sleeping child, and to yourself as well. Thanks Claire. I am slowly get used to the situation and hope in time will find a balance with my emotions too.